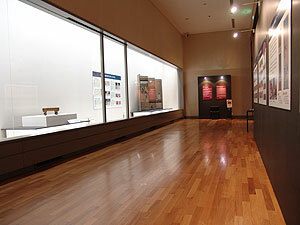 From May 11 (Tuesday) to 23 (Sunday), we displayed art objects that had returned to their homeland of Japan and whose restoration had been completed by the domestic craft centers at the end of 2009, in the planning exhibition room on the first floor of the Heiseikan of Tokyo National Museum. The exhibition took place under the title “Special display: Restoration of Japanese Art Objects Overseas”, and also had the purpose of making publicly known the achievements of the Cooperative Program for the Conservation of Japanese Art Objects Overseas. Three art objects were displayed in the above exhibition – Folding screen of Kabuki Acrobatic Performance and Audience owned by the Ashmolean Museum (UK), Wakaura Gold-Lacquered Shogi Board owned by the Cologne Museum of East Asian Art (Germany), and Incense Shelves with Makie Decoration of the Eight Views of Lake Biwa owned by Museum Velké Meziucí (Czech Republic). This kind of exhibition takes place in the Heiseikan of Tokyo National Museum around this time every year. We hope that continuing to hold exhibitions will let as many people as possible know something about the international cooperation that the Institute is working for. 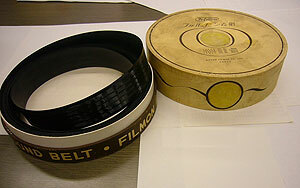 The Filmon Sound Belt is a special storage medium (a kind of record) developed in prewar Japan. The shape is an endless tape made of synthetic resin (approximately 13 m long), and it is said that the tape can record sound for up to 36 minutes. The Department of Intangible Cultural Heritage owns five such sound belts. Since a special player is needed to play them and very few players now remain, it has not been possible to even check what is recorded on them up to now. Since last year, the Department has been researching the Filmon sound Belts jointly with the Theatre Museum of Waseda University (Collaborative Research Center for Theatre and Film Arts). The Theatre Museum stores the players in a playable state, so digitizing the sounds played back by the players is also included in the investigation plan. At present, we have confirmed there are a total of more than 100 sound belts in existence when including those stored in the Department of Intangible Cultural Heritage and Theatre Museum and those owned privately. Unfortunately, quite a few of these sound belts are hard to play back since they have deteriorated noticeably through age, but we are now working to obtain playback sound from as many belts as possible. As part of the Survey Research on Traditional Restoration Materials and Synthetic Resins project, the Center for Conservation Science and Restoration Techniques is conducting a survey on the deterioration of exterior coating material of Itsukushima Shrine. The Itsukushima Shrine is widely known for its beauty with its contrast of a vermilion shrine pavilion floating in a blue sea, but the building is exposed to a severe environment because it is in contact with seawater. And an issue raised by the relevant persons is that the vermilion exterior coating material has become black in a relatively short time. The Center for Conservation Science and Restoration Techniques tried to identify the cause of this blackening phenomenon in the laboratory, also created hand-plate specimens coated with a large amount of the past exterior coating materials which were conceivably used for Itsukushima Shrine, and installed them on the actual floor of shrine and to the pillars which are in contact with the sea surface on May 13 (see Photos 1 and 2). 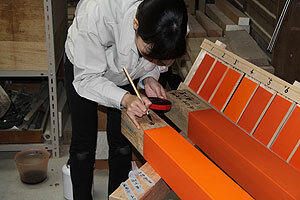 We will perform an exposure test in the environment of Itsukushima Shrine for at least one year and observe the deterioration of exterior coating materials. 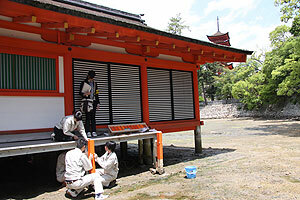 We will use the results to maintain the exterior coating of Itsukushima Shrine pavilion in as good a status as possible. 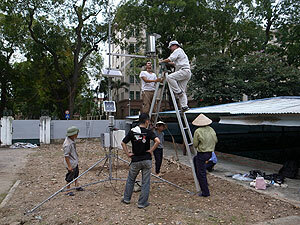 With the Thang Long Citadel Ruins conservation project funded by the UNESCO/Japanese Funds-in-Trust, the partnership convention between the National Research Institute for Cultural Properties, Tokyo and UNESCO Hanoi Office went into effect in April, and the comprehensive support activities spanning for three years have finally begun. From May 17 to 22, we dispatched seven specialists focusing on the conservation science field to Hanoi as the first mission. 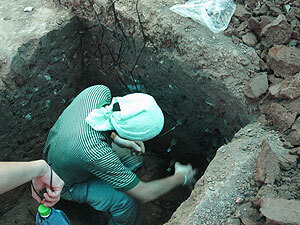 To collect basic data to examine the measures of conserving the excavated archaeological remains, we moved and improved the installed meteorological equipment and installed a new soil-water sensor. 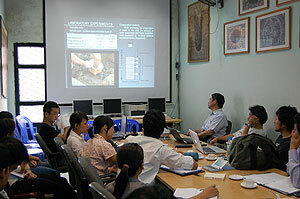 Concerning the unearthed relics, we investigated the method of storing the wooden relics immersed temporarily in water and had a conference with the local administrative organization for joint research on types of Vietnamese wood that are different from those in Japan. Both Japanese and Vietnamese specialists cooperated in working at the local site, and we held a training workshop for young staff members, so that they can understand the significance of work accurately and in detail. 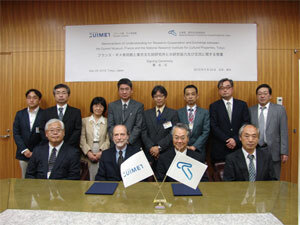 We will sequentially in the future put in force the project activities in various fields, such as historical study and support for control plan establishment.